A few years back, I was in some course where they also taught me some Matlab. One of the exercises was to draw the Sierpinski triangle using a method of progressing a point randomly. I was quite surprised at the time, because I thought the Sierpinski triangle was more of an analytical thing: you drew it using inverted triangles. I wanted to check up on it, and it turns out the method has a name: Chaos Game. To generate a Sierpinski triangle using this method, one starts with a some point inside the triangle. Then, at each step, the next point is half the distance from the current point to one of the corners selected at random. 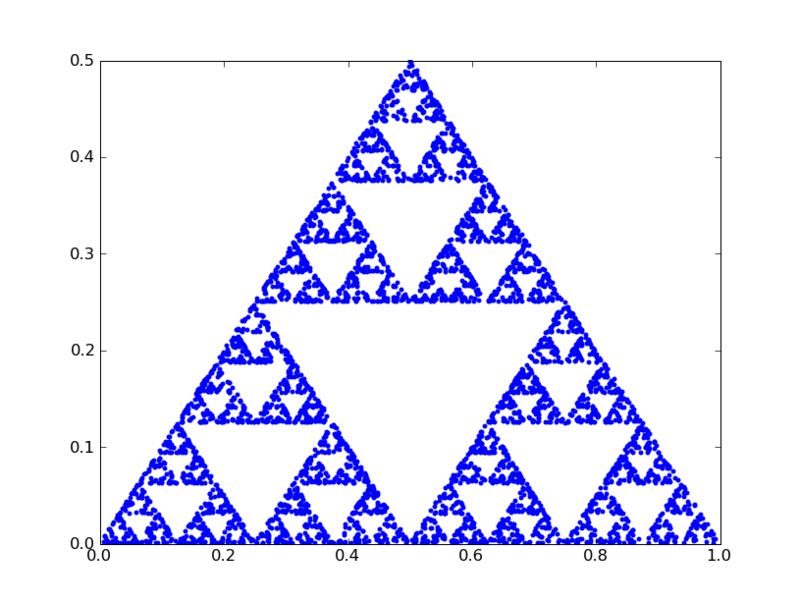 I think this method of generating the Sierpinski triangle is even easier than the analytical one. I used pylab (matplotlib) to create this image. The code isn’t really good, as I didn’t put much thought into it and just hacked it up. Still, I’m putting it up, and I might improve it someday. This entry was posted in Fractals, Programming, Python and tagged ascii-art, fractal, Python. Bookmark the permalink.